The MacKay Clan is from the Northern Scottish Highlands and have been around for centuries. The name MacKay comes from the Gaelic Mac Aoidh meaning Son of Fire. The women were called Nic Aoidh, meaning Daughter of Fire They are one of the most influential Clans of Scottish history. From the roots of the Clan in the Province called Moray to even further back to the most popular tales of the origins. 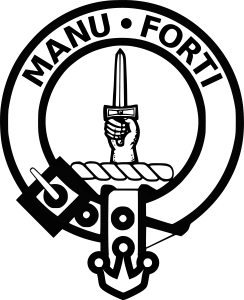 Their Crest was of a dagger held erect and the clans’ tune is titled MacKay’s March and The White Banner of MacKay. A MacKay piper was even present at the famous Battle of Waterloo, playing the tune War and Peace during a calvary charge. Queen Victoria appointed a MacKay clansman named Angus MacKay to the first piper position. Bagpipes are very traditional to Scottish people. The clan had many branches including the MacKays of Strathnaver, Scoury, Bighouse, Sandwood and seven others, along with branches in the Netherlands and Sweden. The MacKays had five principle allied clans. They consisted of Clan Munro, Forbes, Gunn, Ross and Sutherland. The Sutherland, Ross, and Gunn clans however did not become allies until the 18th century. Before then, they were either unknown or enemies of the MacKays. Of course, you cannot have allied clans with out rival clans such as the Clans Sinclair, Donald, Gunn, Ross, and Sutherland. Clans of Gunn, Ross and Sutherland were enemies of MacKays in the 15th and 16th centuries. Also it is claimed by some that the MacKay clan was to be descended from the Clan Morgan but are doubted by some. Also there were MacKay septs of Clan Chattan and other families in Scotland. It was said that the Chief of the clan was descended directly from the Pictish Royal House of MacbEth. They were originally from Ireland but after losing in a battle, they were deported and settled in Moray, defeated and dishonored. But out of the blood of battle their Clan will live on. The first Chieftain of the Clan was born around 1210 A.D. and was a direct descendant the 1st Earl of Ross, Malcolm MacHeth, his name was Iye MacKay. It is said that after a conflict between the clan and their supporters against King Malcolm IV of Scotland, they fled north to the hills of Ross and Strathnaver. While in the north they met Norse Harald Maddadsson, Mormaer of Caithness who was an enemy to the King as well. Enough about the MacKay Clan, I think the history of the clan is very interesting and it is really one of my hobbies, my office job is about a totally different subject. During the week my life involves gokkasten and trading online at itrader betrouwbaarheid i’m happy to say this subject is one of my other hobbies! The Mackay clan would like to thank the the following people and companies for supporting the Mackay clan in educating young people and interested people in the rich history of the Mackay Clan. The people and companies are Jeremy Allan owner of Slot machines UK Ltd., Eric MacKay of VAT Accountants and Edward Mackay of Casumo. Please also have a look at the new free spins casino SirJackpot launched by Edward Mackay. Here you can view a Sirjackpot review which will give you more information on the latest online casino launch of Edward Mackay.